Is the muffin just an ugly cupcake? Well according to T-Shirt makers in 2008, yes they are. Of course the muffin did gain a rather unsavoury reputation just by association with the rather popular “muffin top” saying when referring to a rather inflated midriff. American muffins, not to be mistaken for their much older English yeasted bread like counterparts, date back to the 19th century. 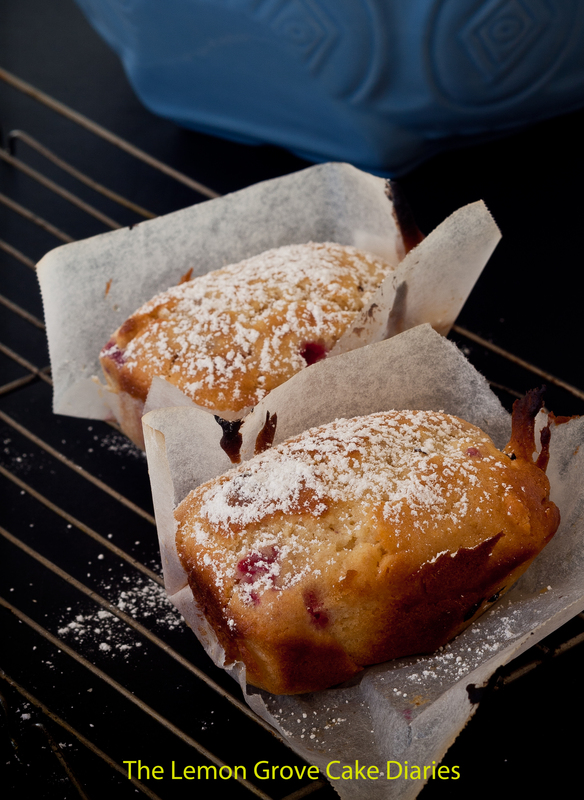 Muffins were in fact quick breads baked in tins with the aid of a chemical leavener. Before the introduction of baking powder pearlash, a refined potash, was used as the raising agent. The pearlash reacted with the acidity of ingredients such as buttermilk to produce carbon dioxide bubbles in the mixture causing the baking product to rise. Potash comes from ashes and lye so I guess it is no wonder that while the pearlash did indeed make a great rising agent it also left a bitter aftertaste in baking. Slightly adapted from Jo Seagar Bakes. Preheat oven to 200°C. Spray muffin pans with oil and line with baking paper. Place all the dry ingredients in a mixing bowl. In a separate bowl combine the melted butter, milk, egg and vanilla essence. Pour the wet ingredients into the dry ingredients and stir with spatula or wooden spoon until just combined. Add chocolate chips and frozen raspberries, mix until combined. Note: to obtain a nice light muffin be careful not to overwork the ingredients. Spoon mixture into the prepared muffin pans and bake for approx. 15-18 minutes or until golden brown. Allow to cool enough so that muffins are still warm, dust with icing sugar and serve. This entry was posted in Chocolate, Muffins, Raspberry and tagged Chocolate, Muffins, Raspberry on April 29, 2015 by lemongrovecakediaries. Did you know that 76% of people eat the ears of a chocolate rabbit first? I have to be honest I don’t know if that little fun fact doing the rounds on the internet is true or false but it would be a pretty tasty survey to partake in. I hope you all had a happy and safe Easter weekend! Put flour, sugar, yeast, butter and spices into a mixing bowl. Using an electric mixer, with a paddle attachment, mix on a low speed until there are no lumps of butter left and the consistency is like breadcrumbs. Change attachment to the dough hook. Add water and mix on a medium speed until dough has come together and is smooth. Add salt and mix on medium high for approx 5 minutes. Dough should be firm and smooth. Place dough on a lightly floured bench and add in the chocolate chips and Nutella. Knead until the chocolate chips and Nutella are evenly mixed in. Place dough in a lightly oiled bowl and cover with lightly oiled plastic wrap. Tip: Keep the oiled plastic wrap, as you can reuse it later in the process. Rest dough in a warm place for approximately 30 minutes. Punch down dough, knead, then cut dough and shape into 10 balls. Cover the balls with lightly oiled plastic wrap. Rest dough for 5 minutes. Reshape balls and place on a baking tray covered with baking paper. Leave a space between each ball, to allow them to double in size. Cover with oiled plastic wrap. Rest dough for approximately 1 hour, in a warm place, until balls have risen and doubled in size. Just before buns are ready to go in the oven, make the flour paste for the crosses by whisking together flour, sugar and water. The paste should be firm enough to pipe. Remove plastic wrap from buns. Bake at 200°C for approx 15-18 minutes. Remove buns from oven and place on a wire rack to cool. This entry was posted in Easter, Hot Cross Buns, Yeast Goods and tagged Easter, Hot Cross Buns, Nutella on April 6, 2015 by lemongrovecakediaries. Ginger has widely been used for its healing properties for thousands of years. Originating in Southern Asia it eventually spread through the rest of Asia, West Africa and the Caribbean. In the middle ages ginger made its way to Europe via the spice trade where it was commonly used to make sweets. Ginger is now grown in many places all over the world including Australia. I came across some interesting “Did you know” facts while looking at the Buderim Ginger, Australian website. Henry VIII praised ginger’s goodness as a cure for the plague. During the Middle Ages, ginger was valued on par with black pepper. A pound of either was worth the price of one sheep. Ginger was the first crop planted in the Americas after Columbus. I can’t honestly say this ginger slice contains all the health benefits attributed to ginger, but it sure is tasty! Preheat oven to 180°C. Spray a 20cm x 30cm tin with oil and line with baking paper. Place the flour, baking powder, ginger, sugar into a bowl and stir to combine. Pour into food processer. Add butter and process until mixture looks like fine bread crumbs. Pour mixture into prepared tin and press mixture into tin until compact. Bake for 35-40 mins or until golden brown and firm to touch. Remove from heat and set aside while you make icing. Place butter, golden syrup and ginger into a saucepan over a medium heat and cook for 2-3 minutes or until butter has melted. Add the icing sugar and whisk to combine. Pour icing over the base and refrigerate for at least an hour or until set. Remove from tin and cut into slices. This entry was posted in Biscuits and tagged Biscuits on March 17, 2015 by lemongrovecakediaries. © Karen Douglas and The Lemon Grove Cake Diaries, . Unauthorized use and/or duplication of this material (including photographs) without express and written permission from this blog's author and/or owner is strictly prohibited. Excerpts and links may be used, provided that full and clear credit is given to The Lemon Grove Cake Diaries with appropriate and specific direction to the original content.